When Livia Harrienger began her college search, she was convinced she wanted to attend a large University. That is, until she visited Brevard. The Watertown, New York, native soon fell in love with the small college atmosphere and the “joyful” people she encountered. Now, thanks to a new scholarship named in honor of longtime faculty member Dr. B. Barbara Boerner, Harrienger will receive financial support in her business pursuits during her time at the College. The new scholarship has been made available through the generosity of an anonymous donor, who chose to fund it not in his own name, but in the name of Dr. Boerner, the coordinator of Brevard’s Business and Organizational Leadership major. This generous scholarship will be awarded annually. The donor noted that Boerner is an incredible representative of not only the BORG major, but of Brevard College as a whole. Harrienger said her professor likes to see people go out of their comfort zone and excel both in and out of the classroom. Harrienger’s interest is within international business, which is a specialty for Boerner’s. 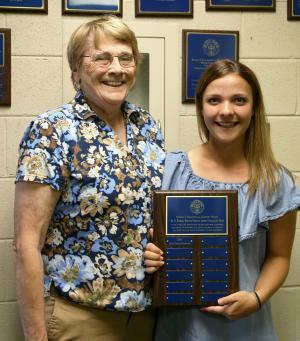 Harrienger, a sophomore, was named the first recipient of the Dr. B. Barbara Boerner Emerging Leaders Scholarship Award during BORG’s annual Awards Banquet in April. Harrienger graduated high school early and entered Brevard at just 17 years old. Since then, she has consistently shown outstanding promise in the BORG program, Boerner said of her student. With 730 students, Brevard College remains intentionally small to give students like Harrienger direct, hands-on learning opportunities. The College seeks to position its graduates for success in their professional, personal and spiritual lives and provide an unparalleled quality of caring within the college community. Harrienger has big plans for the future, with her sights set on attending the University of South Carolina’s renowned International Business program. Her goal is to be a liaison for a Fortune 500 company.